Conduant Corporation specializes in designing and manufacturing digital recording and playback subsystems for scientific research, defense/intelligence, aerospace, and instrumentation applications. Based in Longmont, CO, and represented in the UK by Sarsen Technology Ltd, Conduant provides solutions with off-the-shelf products as well as custom design for leading edge applications. The StreamStor® Amazon SATA disk controller represents a dramatic leap in real-time recording and playback disk controller technology for the PCI bus. 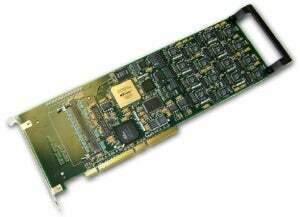 StreamStor® recorders sustain data rates of up to 800 MB/s from a single board. By using multiple StreamStor® devices you can record at 1GB/s or more. The unique approach to moving data direct to disk allows it to take full advantage of the speed of the hardware interface. StreamStor® ensures that every data bit is captured and recorded error-free by the system by dynamically moving data to the hard drive array attached to the system without the overhead of the underlying operating system. Longer recording duration is achieved by simply replacing existing drives with higher capacity drives. StreamStor® is compatible with off-the-shelf SATA drives including 2.5 inch, 3.5 inch and solid state drives. Drives with capacities up to 2TB are supported with total capacity reaching 32TB. StreamStor® Amazon is the only disk solution that lets you choose from a variety of COTS I/O options or use a wide range of popular interface options such as FPDP, Serial FPDP, FPDP 1 and 2, Camera Link or PCI bus for direct-to-disk recording. The StreamStor® product line comes in PCI, PXI and PCI Express form factors. Protocols such as SerialLite II are supported as well. Pairing StreamStor® with off-the-shelf digital I/O boards, DSPs, A/D or frame grabbers allows for additional interface options. StreamStor® Amazon provides the industry’s most powerful and flexible data interface system based on Conduant’s unique modular mezzanine architecture. In addition, StreamStor® Amazon includes features like simultaneous streaming (read/write), data forking, power failure recovery and wrap-mode recording, which have long been standard to meet today’s most demanding applications.